TOP CAT: Soraya has her eyes on the leadership of the Partido Popular. IÑAKI URDANGARIN, erstwhile Duke of Palma de Mallorca, brother-in-law to Felipe VI and son-in-law of Juan Carlos I, is now in prison. He got five years instead of the 17 requested by the public prosecutor and is inside a cushy women’s jail for misappropriation of public funds, tax evasion and money-laundering. Possibly Urdangarin always had the makings of a criminal but it’s doubtful that he would be imprisoned if he hadn’t married a king’s daughter. King Cophetua and the beggar maid? No problem because she married up. But Iñaki and Cristina? Big trouble, because you have a princess and the pea situation. She was brought up knowing she’s a royal princess and he strove to make sure she lived in the manner to which she was accustomed. But she was a royal princess and was always to feel that ruddy pea however high Iñaki piled up the mattresses that he bought with public money. CAT FIGHT on the horizon. Soraya Sainz de Santamaria is having a shot at the Partido Popular leadership. So is her eternal rival Dolores de Cospedal and these are the two that everybody will be watching rather than Jose Manuel Margallo, Jose Ramon Garcia Hernandez or Pablo Casado. Margallo, Rajoy’s Foreign Minister until 2016 often talked sense and national MP Ignacio Garcia Hernandez still does. Casado is preppy in the same way as Ciudadanos leader Albert Rivera but otherwise colourless. Galicia’s regional president Alberto Nuñez Feijoo won’t run at all which is unfortunate as he makes more sense than the lot of them put together. So we’re left with a cat fight that will be interesting to watch as either woman could draw in the punters who always vote PP, come hell or high water or incontrovertible proof of corruption. But they are tainted by association with the Rajoy Government and a victory for either means curtains for the PP in its present form. 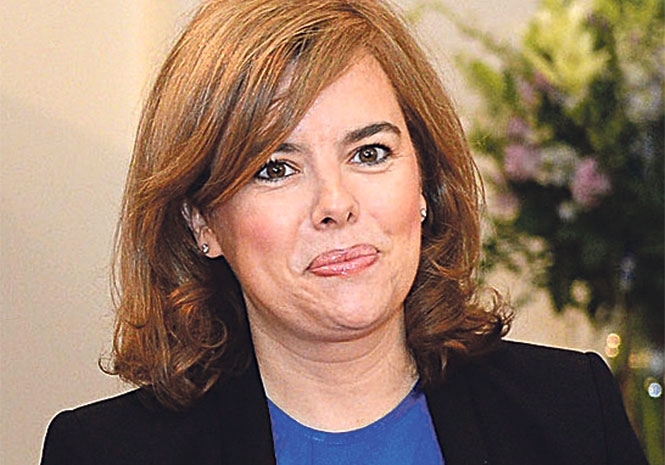 The party’s only hope of regaining power is with a new and attractive face that can give Pedro Sanchez, Pablo Iglesias and Albert Rivera a run for their money. More importantly there can’t be the slightest whiff of scandal attached linked to their names. This narrows the choice dramatically, which means that the PP is condemned to making do with the same- old, same-old. THERE was once a policeman named Antonio Gonzalez-Pacheco. He was nicknamed Billy the Kid and in 1977 was awarded the Police Medal for Merit for having enjoyed torturing Franco’s opponents in the dying days of the regime. The calls for him to be stripped of the medal and the 15 per cent increment to his police pension began immediately after Spain’s transition to democracy. Successive governments have tried half-heartedly to remove both and Pedro Sanchez has said that this time he will see what can be done. Meanwhile the Director General of Police maintained that detailing Gonzalez-Pacheco’s ‘merits and services’ could infringe his privacy and leave him in a ‘constant state of anxiety.’ But not as anxious as he left his victims. PEDRO SANCHEZ’S government is prepared to remove Francisco Franco’s remains from his Valle de los Caidos mausoleum for burial elsewhere. “An established democracy like Spain can’t permit symbols that separate the Spanish,” the president said, provoking an outcry from the usual suspects. At least Franco won’t be dug up, hung in chains and belatedly beheaded like before-his-time, Oliver Cromwell.